Space Station astronauts repaired a minor leak in the Soyuz MS-09 spacecraft (left) on Aug. 30, 2018. A 2-millimeter hole in the orbital module, shown here, caused a slight pressure drop inside the orbiting laboratory. According to a new joint statement from NASA and Roscosmos, Russia's federal space agency, Roscosmos Director Dmitry Rogozin invited NASA Administrator Jim Bridenstine to meet in a teleconference on Wednesday (Sept. 12) to discuss the investigation. Expedition 56 crewmembers located the 2-millimeter (0.08 inches) hole in the orbital compartment of the Soyuz on Aug. 30, shortly after ground controllers noted a slight drop in pressure on the Russian side of the space station. After astronauts plugged the hole with a combination of gauze, epoxy and heavy-duty tape, pressure inside the orbiting laboratory returned to normal. While NASA and Roscosmos haven't determined the cause of the leak, Rogozin initially speculated that a micrometeoroid could be responsible. However, Rogozin later said that the hole appears to have been human-made, as if an engineer with "a faltering hand" drilled the hole either accidentally or deliberately. "The administrator and the general director noted speculations circulating in the media regarding the possible cause of the incident and agreed on deferring any preliminary conclusions and providing any explanations until the final investigation has been completed," NASA and Roscosmos officials said in their joint statement. 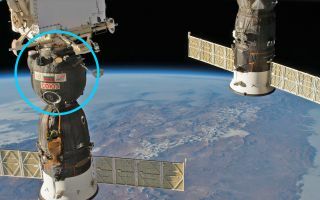 Earlier this week, NASA astronaut Drew Feustel, commander of Expedition 56, shot down the idea that one of the station's six crewmembers could have intentionally caused the leak in an act of in-orbit sabotage. "I can unequivocally say that the crew had nothing do with this," Feustel told reporters during a space-to-ground interview. Bridenstine and Rogozin "acknowledged the entire crew is dedicated to the safe operation of the station and all docked spacecraft to ensure mission success," the statement said. Bridenstine and Rogozin will have their first face-to-face meeting at the Baikonur Cosmodrome in Kazakhstan next month, when NASA astronaut Nick Hague and Russian cosmonaut Alexey Ovchinin will launch to the International Space Station in the Soyuz MS-10 spacecraft, according to the statement. The Soyuz MS-09, where the mysterious leak was found, is scheduled to return to Earth in December with NASA astronaut Serena Auñón-Chancellor, Russian cosmonaut Sergey Prokopyev and European Space Agency astronaut Alexander Gerst.